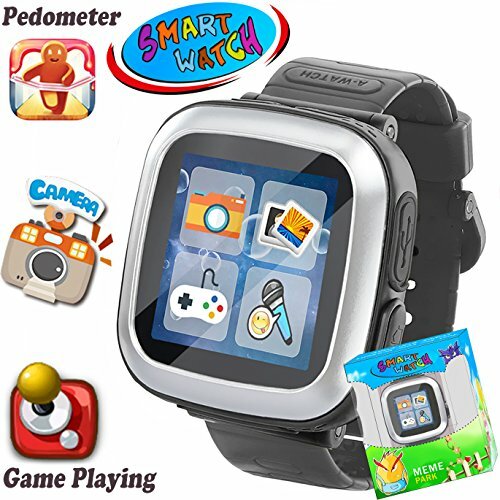 ⌚iGeeKid Kids game smart watch ---- Designed specifically for children, the rich functional design create a perfect entertainment experience for kids. ⌚AR Upgrade Version: Compared to ordinary game watches, our watch built-in 30 animal cartoon images. Children can switch views of animals 360°, bring more intuitive three-dimensional game experience to children, and can better exercise children's cognitive ability and space imagination. The new calculator function can exercise your child's Logical computing ability and improve the sensitivity to numbers. Let your child increase his intelligence while entertaining. ✅Diverse Choices: The watch has a total of four colors, lovely pink-purple, cool silver- black, fresh gray-green, noble purple-red.We have designed a lovely dial and equipped each dial with an eco-friendly and comfortable watch strap. The strap is a unique anti-sweat material that can take care of your child's wrist skin. Also each of our products has exquisite gift wraps. You can choose one or more watches for your child,bring the distance between you and your child closer. Funny Panda Recording Game: A funny panda will play with your child. You can record the voice and sing song, the panda will distorted your voice and repeat what you said and sang. When you touch different parts of its body, it will give you different actions. It's a good friend for child!